Click to enlarge. 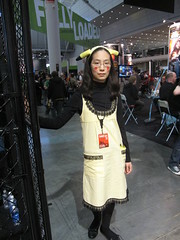 Left: front view at Pax East 2011. Right: back view. Fabric and Materials: Checked yellow cotton fabric for the jumper and headband. Synthetic lace trim. 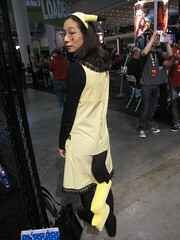 Yellow short pile faux fur and black flannel for the tail and ears. Notes: Made winter/spring 2011. I made the headband following the tutorial on Craftster by aschnebly posted here. I free-handed patterns for the ears and tail, sewed them out of fuzzy fabric, stuffed them with polyfill, and tacked them to the headband and jumper, respectively.